Daily Greatness might be the best motivator in my plan to be a better me; both physically and mentally and start 2016 off fresh! This week I received my “Daily Greatness Journal” from author Lyndelle Palmer Clarke and I already feel empowered with the turn of the first page. The main goal; for you to live in a better world and know your deepest desire and make those happen. You will personally create your own “Greatness Blueprint” which is what you personally want out of your life and how to make that a reality. This journal is a daily planner, goal planner, daily/weekly/yearly check-in to your goals, gratitude journal, appointment planner with helpful reminders to keep you on track the entire time. The entire outlined “journey” involves 8 Daily Steps done morning and night: Meditation & Visualisation (relax for focus), Gratitude (list of what you are grateful for), Inspired Actions (your priorities for the day), Intentions (your mindset), Dreams (personal creativity log), Inspiration (keeping your purpose on track), Energy (healthy diet and exercise) and Evening Power Questions (evaluate your day and your inspired actions to plan forward). It seems like a lot of information and planning, but it really isn’t and truly makes sense. It truly feels good to view yourself and what you have written each week in an effort to change your course or keep yourself going strong! I love listing my achievements and what I need to forgive and forget to lose the negativity. What is valuable to me? What do I see in myself? I love this daily gift I am giving myself. 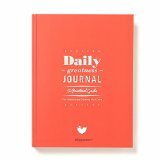 The journal is $44.95; please visit http://dailygreatness.co/ for more information and additional items to help you on your way. There are great training journals, yoga journals as well as a business planner! Great start to my new year!